For many of us American history-nerds, the great British country houses seem to exist in an almost supernatural state of romantic perfection. They're the idealized places we imagine in Jane Austen's novels and see as backgrounds in films (among them: Brideshead Revisited, The Duchess, Pride and Prejudice, The Go-Between.) As an art history major in college, I sat in darkened classrooms and gazed in awe at slides of Palladio-inspired majesty, nestled in flawless green landscapes. But reality is often not so kind. Taxes, war, changing societies, and shifting family fortunes all take their toll. Even houses made of stone become vulnerable over time (see Highclere Castle, playing the namesake of Downton Abbey.) Nowhere is this more tragically evident than at Mavisbank, a once-grand country house south of Edinburgh in Midlothian, Scotland. Built in 1723-1727, Mavisbank, above, was one of those rare collaborations between the foremost architect of the day in William Adam and an artistic, appreciative client in Sir John Clerk. The magnificent house, grounds, and gardens (the painted view, right, features the canal that pointed towards the house) they created was the first Palladian-inspired villa built in the north, and instantly became known as one of Scotland's most important and beautiful country houses. Yet by 1815, the house had already passed from the Clerk family, and in 1876 the once-elegant house became a lunatic asylum. For the next 70 years, insensitive renovations and additions further eroded the building's beauty. 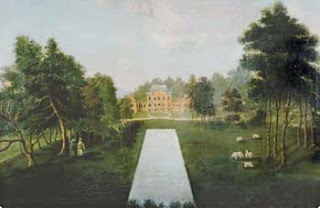 The famous gardens and surrounding fields went untended. 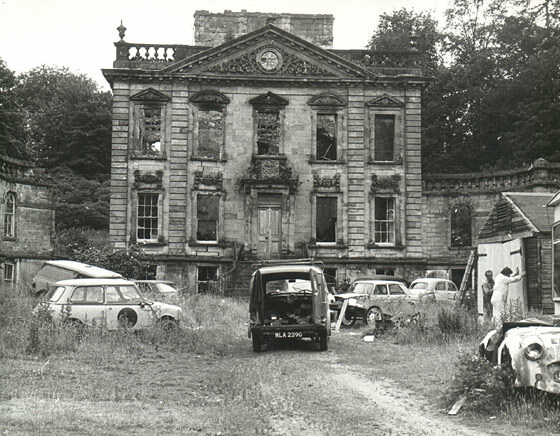 Although the house was no longer used as a hospital, its last private owner was perhaps the most abusive of all, letting Mavisbank become a tattered haven for squatters and trailers, its front court used as an automobile junkyard, left. A devastating fire in 1973 gutted the interiors and destroyed the roof. Threatened with demolition, emergency stabilization offered a temporary respite while preservationists fought to save what remained of the house. In 2008, Mavisbank was included on the World Monument Fund's list of the 100 most endangered historical sites in the world, increasing interest in preserving the site. Mavisbank's salvation finally seems assured. 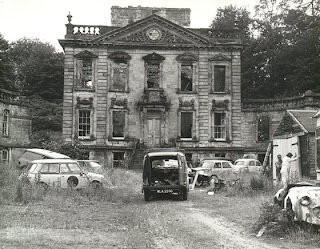 Last month, the sale of the house was finally arranged by the Midlothian Council, which planned to transfer the house to its own preservation trust. What exactly will happen next, however, still remains undecided. Should the shell be further stabilized, but left in its romantic, derelict state, or should the goal be a complete restoration, a recreation of what Mavisbank once was? This video slideshow of Mavisbank as it stands at present shows how monumental (and costly) either task will be. What do you think Marisbank's future should be? Below: Mavisbank House, Midlothian, Scottland. Photograph from National Monuments Record Scotland courtesy of RCAHMS. I think it would be pretty awesome to leave it in it's ruined state, actually. It's a part of the house's history, and anyway there are already more than enough meticulously preserved stately houses. Why not one with something different to offer? That is a tricky question because I have a thing for both country houses and ruins. It's so sad to see this one in its ruined state but that perhaps is the best state to keep it in now. I'll have to go see this house since we're neighbors! At some point, new construction takes over and we're left with a reproduction -- a nice one with period bits and pieces, sited on the original site -- but no longer the original. I agree with the comment directly above. It would be impossible to fully restore the house and grounds to its glory days--or, at least, prohibitively expensive--so I'd let the grand old girl have a dignified end. To be honest, if it were to be restored, I'd be more interested in having it restored to its condition as an "insane alysum", in memory of the people who were probably abused within. Besides people who were just put away for convenience, people with actual mental health issues were dealt with in the worst way — basically tortured. Of course I have no idea of the history of this particular house, but if I remember correctly, the first sweeping reforms weren't until the turn of the century. I think it'd be better to acknowledge that history of abuse and memorialize the victims, rather than gloss over that part and restore the house to a former glory. A unique program to restore historic buildings was started in my area of the US. Carefully selected tenants were chosen for the buildings. They live in the structure rent free but pay for restorations out of their own pockets. All work is overseen to ensure it remains true to the building's history. I saw a news program on TV last week where a version of this program in Germany. Since reunification, there are many derelict buildings in Eastern Germany. Tenants move into them and volunteer their labor restoring the structures. In this case, all repairs costs are shouldered by the building's owner and a preservation organization. Mavisbank is in shambles. I don't know if it would be cost effective to restore it. But before the Midlothian Council gives up on the old girl, they should explore options like these. Who knows? There might be some folks dedicated enough to preserving her that they'd be willing to foot some of the bill. As expensive as restoration would be, I imagine in the long run it would be cheaper (and easier) than attempting to forestall further decay without addressing the roots of said decay. Mavisbank is a tragic house. I wrote about it in my 2003 book, Restoration (written to accompany a BBC television series of the same name), and recounting how a building that began as a perfect 1720s house and a foundation stone of the Scottish enlightenment and had become a fragile ruin was a sobering experience. Back in 2003, a restoration seemed just possible; stabilization seems a more likely solution now. It's a shame to see such a beautiful house in ruins. Although it would be very expensive, I'd prefer to see it restored to its full glory. But I have to admit even in its ruined state, it has a certain tragic charm. Well, for a start there's no money, so the question's probably moot ;) I don't think I'd like to see it done though. As another commenter said, the state of ruin is also part of its history. I mean, which period would you (generic you) restore it to anyhow? I'd like to see it frozen as it was when acquired by the Trust. I, too, thought of Miss Havisham with this house. Knowing how beautiful and perfect it must have once been, and then seeing how neglect and ignorance have left it so ravaged really breaks my heart. There's one theory that all Western architecture is either classical or romantic; Mavisbank is a house that was conceived as a perfectly proportioned example of classicism that, over time, has now decayed into an equally perfect example of romantic ruin. Stabilize. Preserve whats left. What's gone is gone. I say that if someone with the money wants to recreate the building to how it once was, let them do so. It's not the building itself that gives life, but the people who have made their contribution to the building's history. I don't think that anyone should be prevented from rebuilding a home that is currently a shell back to how it was when last used as a family home. To keep it as a ruin is only going to be eroded to the elements.